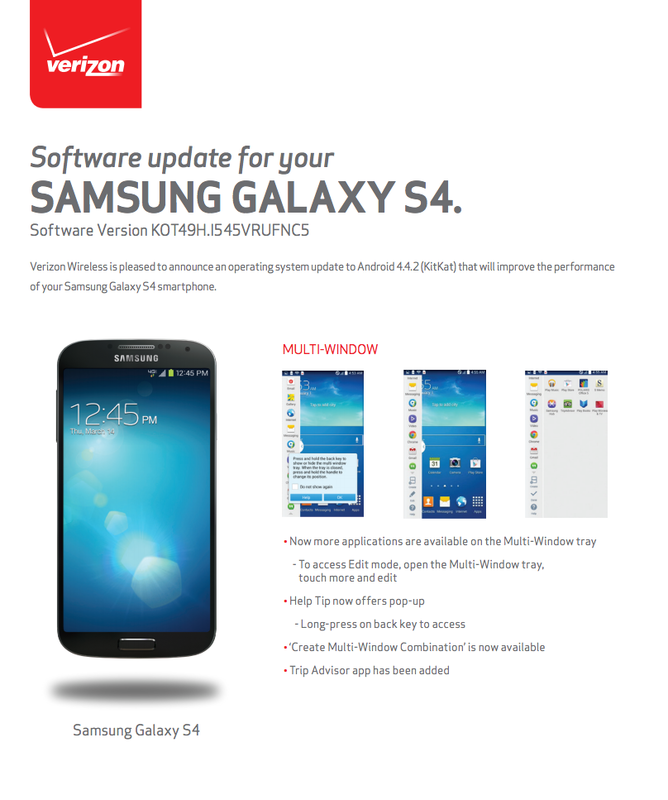 This morning, Verizon finally began pushing out Kit Kat (Android 4.4.2) to its variant of the Samsung Galaxy S4. While they forgot to publish the changelog for the major update before the update went live, we now have one from both Samsung and Verizon. As you would expect from an update of this magnitude, there are all sorts of new goodies. 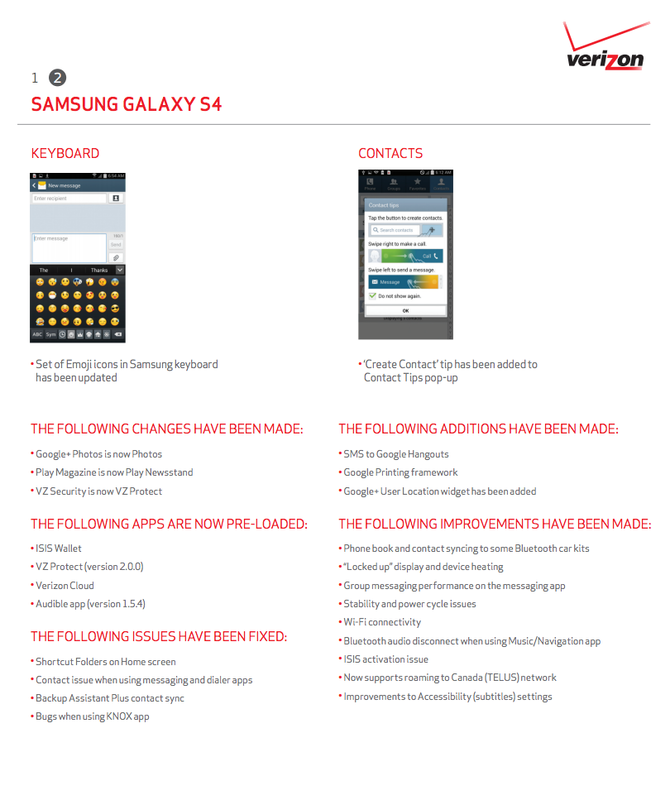 Owners of the VZW Galaxy S4 will welcome in Isis Mobile Wallet, the VZW Cloud, Tap & Pay (for mobile payments), an updated lock screen, updated bloatware, Google cloud print framework, and more. Again, the update is massive, so be sure to take a look at all of the changes below. Apps Menu: Menu in Apps has been updated based on UX simplification on Galaxy Note3. Play store and Share apps have been removed. Disabling application feature has been added. Widget Menu: The Play Store menu has been removed from the menu. Widget: Google+ User Location’ widget has been added. Lock Screen: Position of date and time on lock screen has been adjusted. Camera shortcut on lock screen has been added as default . Notification: Color of status bar icons has been changed based on Google’s requirement (white theme). The ‘Ongoing ’ notification has been removed. Multi Window: The recent multi-window feature with edit mode (implemented in Note3) has been applied. Help Tip pop-up (regarding long-press on back key) has been added. The ‘Create multi-window combination’ menu has been added. The ‘TripAdvisor’ App has been Added. Keyboard: Color of keyboard buttons has been updated. The Button layout in handwriting mode has been updated. The buttons are moved from the top to the bottom to keep consistency between handwriting mode and normal keyboard. The set of Emoji in Samsung keyboard has been updated. Camera: Settings > Metering mode menu has been changed the text from ‘Metering’ to ‘Metering mode’ Settings > Settings > Review Menu has been changed the text from ‘Review’ to ‘Review pics/videos’. Contacts: “Create contact” tip has been added to Contact tips pop-up. Default value for Do not show again has been changed to unchecked. Email: The drawer menu list has been changed in Email app after user set up an email account (single) *Path : Idle / Apps / Email / Drawer menu. The notification pop up has been added when there is no recipient added. *Path : Idle / Apps / Email / Compose / Select send icon without adding recipients. ‘Email notifications’ (in Priority sender settings) subtext has been updated to describe notification behavior in details. *Path : Idle / Apps / Email / Menu / Settings / Priority senders. Email sync settings are changed based on Google KitKat update ‘Period to sync Email’ menu has been added and ‘Number of emails to load’ is removed in IMAP Email sync settings. ( Email / Menu / Settings / Account settings / Select account / Sync settings ) ‘Auto resend times’ menu has been removed. Maximum time is set to 3 times. Group Play: Verbiage change: Start screen of Group play. Messaging: The default messaging app interaction has been updated (Same as K). When the user attempts to change the default messaging app to Samsung Messages, the below UI will display. The ‘Font size’ menu has been added in Messaging app. *Path : Idle / Apps / Messaging / Menu The ‘Default messaging app’ menu has been added in Messaging settings. *Path : Idle / Apps / Messaging / Menu / Settings. Emergency message settings are deleted from Settings. *Path : Idle / Apps / Messaging / Menu / Settings. ‘Font size’ menu has been added in the Messaging compose page. *Path : Idle / Apps / Messaging / Compose / Menu. Music:Music / Songs tab / NC2 added play time on play bar. Phone: The ‘Help’ menu has been added in phone app. *Path : Idle / Apps / Phone / Menu. Video: Verbiage changes: Information > Announcement.